Leaves are falling, days are shorter and the temperature’s dropping, the time right now is perfect to celebrate Fall and grape harvest. 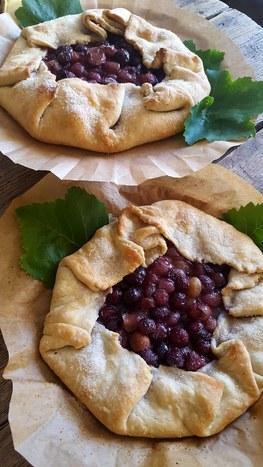 Make one large tart or two to share with friends using roasted grapes with just a touch of sugar. In a food processor, combine flour with sugar and salt. Add cold butter and egg and pulse 5 times until the mixture is crumbly. Add 1-2 tablespoons ice water at a time, or more as needed, and pulse again until a dough ball has formed. Remove and flatten the dough, wrap and chill for 30 minutes. (This will make it easier to roll out.) On a clean work surface liberally sprinkled with flour, begin to roll out the pastry to a 12-inch wide and ¼-inch thick circle, using the rolling pin, apply light pressure while rolling outwards from the center of the dough. Every once in awhile, add flour and turn the pastry a quarter turn so it rolls out uniformly. As the edges fray, pinch them with your finger and continue rolling. Lift the pastry and put onto a large parchment paper–lined baking pan. It’s important to put your pastry on the baking pan before filling. Preheat the oven to 400°F. Spread the marmalade over the pastry base leaving a 3-inch edge around the outside of the circle. Toss the washed grapes with brown sugar and cornstarch, then spread the grapes all over the base, piling them towards the center, and dot with the butter. Fold in the sides of the pastry towards the center leaving the center uncovered. Use a pastry brush to dab water all over the top edge of the pastry and sprinkle the pastry with granulated sugar. Bake in preheated oven for 30–40 minutes, until the pastry edges are golden brown. Allow to cool for 10 minutes. Cut into wedges and serve warm with dollops of chilled ricotta cream. For Ricotta Cream: 1 cup ricotta cheese mixed with 2 tablespoons heavy cream, 2 tablespoons honey, and 1 teaspoon orange zest. © 2018 Private Chef Robin All Rights Reserved. Santa Barbara Web Design by Pinnacle Platform.